UHF CB traditionally had 40 channels (Wide Band, 25 KHz channel spacings). The UHF CB system has been upgraded to 80 channels (Narrow Band, 12.5 KHz channel spacings) which in turn gives you more flexibility. CLICK for a printable coloured JPG version of 80 Channel info. New channels 41 to 80 are located halfway between each of the original channels (eg. channel 41 is in between channels 1 & 2). The original 40 channels are now Narrow Band but remain unchanged in their frequencies. For a list of the new frequencies click 80 Channel Frequency List here or go via. the Main Menu. The mix of Narrow Band (NB) & Wide Band (WB) operations within UHF Citizen Band (CB) can cause some interference & differing levels of receive volume. Below are a some examples! When a NB radio receives a transmission from a WB radio on the same channel, the audio may sound loud & speech distorted. When a WB radio receives a transmission from a NB radio on the same channel, the audio will be quieter compared to a WB radios transmission. When using a WB radio for example on channel 10 & a NB radio is using channel 49 or 50 (which are adjacent to channel 10. The WB radio will hear the NB radio which will sound distorted & off frequency, whereas a Quality NB radio will not open it's squelch to the WB radio. If you have a new generation GME radio (TX 3100 - TX 3345 - TX 3500 series - TX 4500 - TX 4600 or TX 6500). All these radios have a DVC wide band compensator which reduces the differing receive volumes between NB & WB radios. These new radios also have Digital Signal Processing (DSP) & Advance Signal Management (ASM) which identifies interference caused by signal on adjacent channels, preventing opening of your radios squelch. For more information on these new radios go to www.gme.net.au. CLICK for a printable coloured JPG version of below info. SIMPLEX: Receive & transmit on same channel. 43 simplex channels in total. Channels 9-30 (excluding 22-23) + 39 & 40, 49-70 (excluding 61-63) + 79 & 80. DUPLEX: Receive from repeater on it's output (transmit) channel (1-8 & 41-48). Transmit to the repeater on it's input (receive) channel (31-38 & 71-78). 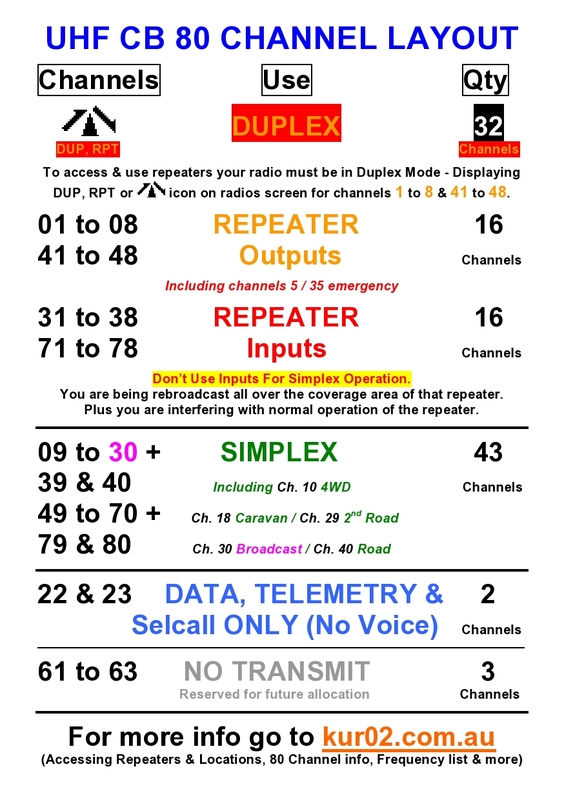 There are 32 duplex channels in total. (16 receive & 16 transmit). DATA: Transmit and receive data / telemetry. There are 2 channels in total (22 & 23). NO TX: Channels 61-63 are reservered for future expansion & are not usable at this time. 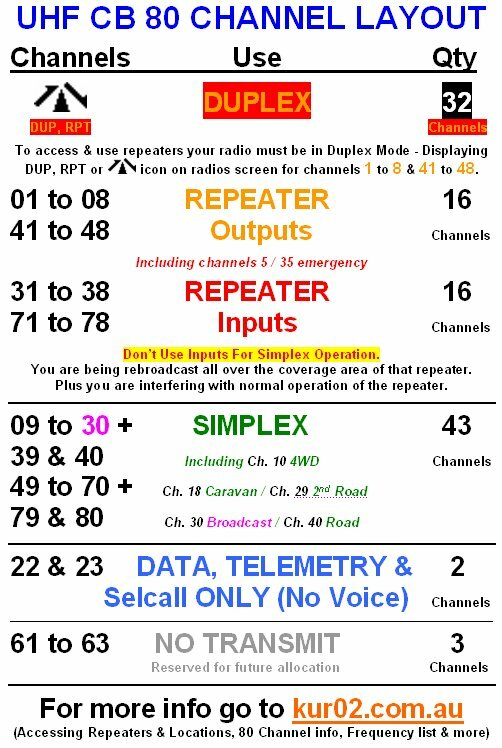 IMPORTANT - to access UHF CB Repeaters the radio must be in DUPLEX MODE – Displaying DUP, RPT or repeater icon on radios screen for channels 1 to 8 & 41 to 48. NOTE:- Channel 30 is a local/community Alert & Broadcast channel, for supplying information on Road Closures - Accidents - Fires & Severe Weather Warnings, plus any other local emergency news. Channel 30 is also part of The Early Warning Network (EWN) for more info visit www.uhfcb.com.au/UHFCB-Broadcast-Network.php plus you can register for alerts by location @ www.ewn.com.au. This information is provided by Duoro Services. CLICK for a printable version of info sheet below. See below for the upgraded UHF CB channel layout.